In the past few years, solar pumps have consistently piqued the interest of various bureaucrats and politicians. The Prime Minister spoke about solar pumps from the ramparts of the Red Fort in 2016. There is no shortage of ideas which the Centre, States, civil society organisations, and enterprises are adopting to enhance penetration of solar for irrigation. India must exploit the potential of this technology to help farmers meet irrigation needs. Why do we need to opt for solar powered generators when simple, diesel generators are in existence? Diesel generators generally preferred over solar powered ones due to the initial cost of installation. But if one can think about the future expenses that would be in store, the individual would prefer solar generators. Diesel generators would need a constant supply of fuel – this would cause the investment to pay back itself, owing to the ever-increasing price of fuel. In warm/hot countries, solar generators are more reliable. But in countries where there is less sunshine and more rains and winds, solar energy doesn’t come in handy. However, in Germany, solar energy is used at a much higher level than in North America. Hence, reliability is not an issue when it comes to solar powered gensets. In Kheda district Gujarat, the Solar Pump Irrigators’ Cooperative Enterprise (SPICE), which began operating in May 2016, not only made a switch from diesel to solar pumps but also adopted net metering–selling excess power to the local electricity utility. Members now have an incentive to save power and curtail their groundwater use, as any leftover power is sold to the local power utility, thereby creating a parallel revenue stream. A solar pump is viewed not only as an irrigation asset but also an income-generating asset that has potential to deliver ‘climate-proof’, risk-free income stream. Solar energy is an alternative renewable energy that is increasingly becoming mainstream due to cost feasibility and higher efficiency. Solar energy is inherently decentralized way of energy production. Sunshine is equally distributed everywhere. So, solar power can be generated at the point of consumption. Maharashtra is solarising its agricultural feeders by installing solar power plants at the substation level, through competitive bidding. 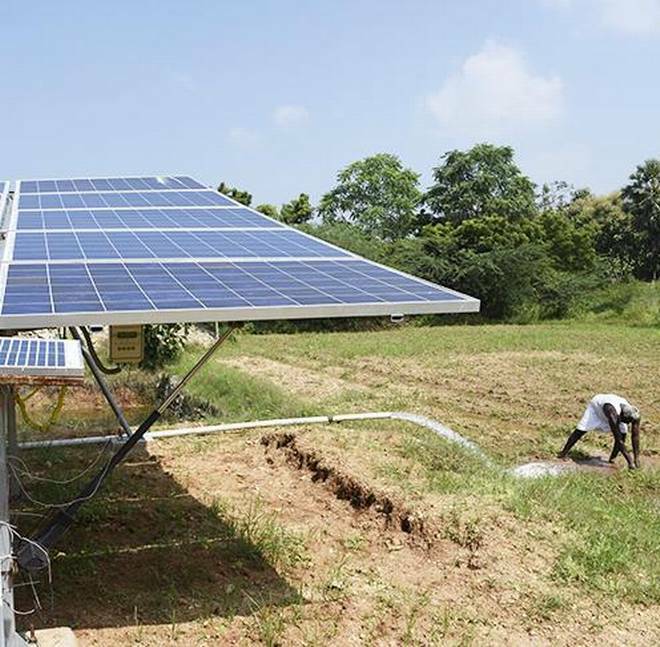 Karnataka is promoting solar pumps for existing grid-connected farmers under a net-metering regime, allowing them to generate additional income by feeding back surplus energy into the grid. In eastern States, GIZ, a German development agency, has piloted community ownership models providing water-as-a-service using solar pumps. Despite the diversity of approaches and significant government subsidies, only about 1,42,000 pumps have been deployed till date against a target of one million pumps by 2021. Such limited demand, in a country with 132 million farmers and 28 million existing irrigation pumps, calls for a reflection on existing deployment approaches. In India, despite the existing 19 million electrical pumps and about 9 million diesel pumps, 53 per cent of India’s net sown area remains unirrigated. But farmers’ perspectives have to be considered and the local context appreciated when deploying the technology to maximise economic returns. What can be done to promote solar for irrigation? Target marginal farmers with smaller solar pumps, particularly in areas with good groundwater development potential as many of these marginal farmers relied on buying water, the costliest option for irrigation, or on renting pumps to meet their needs. Couple solar pump deployment with micro-irrigation and water harvesting interventions at the farm and community levels. While lack of irrigation is a major bottleneck, 30% of farmers reported limited water availability for irrigation as a challenge. Encourage sharing of solar pumps among farmers through farmer extension programmes. Given zero marginal cost of pumping with solar, water sharing, already a prevalent practice in many parts of the country, helps put a marginal price to the water. Provide interest-subsidy to farmers combined with reduced capital subsidy to enable large-scale deployment of solar pumps in a shorter span of time. Such an approach would cover a greater number of farmers, helping them reap the benefits of solar pumps sooner, and increase overall returns to the economy. Solar farming is not only environmentally friendly, but also reliable and cost effective. Maintenance cost is low, since there will be fewer moving parts and lesser impact of oil corrosion. Guided by on-ground experiences and an expanding body of research, the government should continuously improve and innovate its support mechanisms on solar for irrigation. The Indian government should help farmers by providing subsidies and loans to acquire solar powered agricultural tools. Agricultural experts should encouraged to guide farmers in operating them. India must exploit the potential of this decentralised technology to achieve the dual national targets of 100 GW of solar and doubling farmer’s income by 2022 — setting a world-class example of greening the economy and overcoming its developmental challenges, simultaneously.